The Place My last visit at Tamashii Robataya was for its Whisky Sukiyaki two years ago. 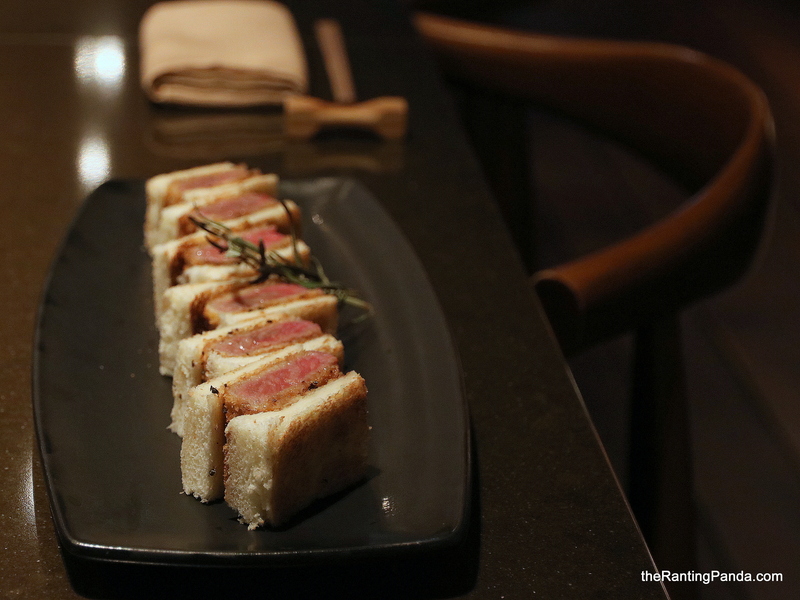 The Japanese restaurant along North Canal Road in Raffles Place has a few new ala carte dishes and Omakase menu recently, featuring one of the most hyped trend the past one year, wagyu beef sandwich. The Food I tried one of its new 8-courses Semi-Omakase Dinner at S$168++, which is very good overall in terms of quality. I started with the Zensai, with four types of appetisers with the likes of Beancurd skin with Murasaki uni, lobster meat and beltfish, shrimp with caviar, as well as raw eggplant. These items are seasonal ingredients. Next course is the Sashimi Moriawase. The interesting but here is the soya sauce foam where you can drip over the sashimi. I had a mix of otoro, amberjack and scallop sashimi, all of which are fresh. The fatty otoro is my favourite! The next course is the Kani Uni, where you get king crab tossed with sea urchin. The Hokkaido hairy crab meat is very sweet and fresh, topped with Hokkaido Murasaki uni which is very indulgent and enjoyable. The Yaki Sakana next is the grilled seasonal fish. I had the marinated black trout, which is caught off the deep waters in Japan late at night. The grilled fish has a very fatty texture for all that omega 3 nutrients. I love chawanmushi. It is such a simple dish yet one that is hard to execute well. This Truffle Chawanmushi comes with truffle shavings but what makes it so delightful is the incredibly smooth and rich flavour of the steamed egg custard. On to the mains, the Saga Gyu Donburi is one of the all-time signatures at Tamashii Robataya and I’m glad it is on the omakase menu here. The saga beef rice is topped with onsen egg and truffle shavings, where the beef is fatty enough for me. Mixed all the ingredients well together and the result is a delectable bowl of goodness. The last savoury dish is the soup of the day, or Owanmono, where I was served clam miso soup. For dessert, we were served Japanese peach along with sea salt ice-cream which is made in-house. In terms of the new ala carte offerings, one of the luxurious dishes is the Saga Gyu with Uni and Caviar (S$45). The Saga beef here is rolled with sea urchin and topped with caviar, and is best taken all at one go. The overall flavour is a burst of umami for me! I love the luscious bit from the uni while the Saga beef is simply oh-so-tenderly delicious. Order this if you feel like you deserve a big treat for yourself. Another dish new on the Omakase menu is the Awabi Mushi, where you get steamed abalone from Hokkaido prepared with sake, served with two types of sauce – liver and liver truffle sauce. I prefer the liver truffle sauce, which is more flavourful to go along with the fresh abalone. The A5 Miyazaki Gyu Sando (S$98) is one of the exciting addition to the menu. I first tried wagyu beef sandwich at Wagyumafia in Tokyo, and can’t help but draw comparisons between the two. The bread for the homemade sandwich here is spread with apple infused sauce and has a nice crispy texture. The A5 Miyazaki here is quite tender with the sandwich and the overall flavour is much better than my Tokyo experience. The price tag is high for this serving of about 120-150g wagyu beef, where there is also the relatively cheaper Saga A3 Sando (S$48) with the same serving size. Rants Admittedly, prices of the ala carte dishes for dinner are pretty steep which makes the omakase set meals a much better value. Will I Return Again? I enjoyed the flavours of the dishes at Tamashii Robataya. While prices are steep, it is one Japanese restaurant in Singapore which is worthy of a splurge. The Whisky Sukiyaki and Saga Gyu Donburi are some of the dishes which I still remember and crave for. For better value of the dishes in general, go for the lunch sets on weekdays if time permits. Make your reservation instantly at Tamashii Robataya here.